Ninya Lee Greek provides a thorough and professional Fine Arts Appraisal. She has expertise in all Types of paintings and in all Eras, from the 1100’s to Present. Additional specialties include: Sterling Silver, Gems and Jewelry, Furs, Ceramic Porcelains, and most recently, Firearms, Coins and Stamps, plus Vintage books. We have added additional Experts to our staff. One of our experts is a Framer, who works on a contract basis. 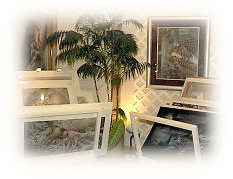 When needed, we can re-frame or replace glass on your artwork. In addition to Appraisals, Ninya provides service for Fine Art Restoration. She, personally, can clean, “in painting” and “over painting”, as well as repair Oils, Watercolors, Pastels, Pencil Drawings, and any two or three-dimensional Fine Arts. As a Fine Arts Gallery, Corporation, or individual you can rest assured that your Fine Arts Appraisal and/or Restoration will be handled with explicit care and attention to detail. We will discuss with you, during the first interview, what exactly will be involved, and give you a to the penny quote. You will not be expected to go into any situation “Blind“. Ninya has her USPAP designation as required for Federally Qualified Appraisers and all continuing education classes to date. This firm is appointed with many of the Insurance Claims offices, in the State of California; therefore, we understand what is needed and will be able to follow their guidelines. We are based out of the Coronado, California area; however, we have two other locations throughout San Diego. We will also come to you; anywhere in the San Diego County, as well as the majority of North County. “Ninya is a blessing. She’s very professional and courteous and we were very pleased to have her appraise our items. She “enlightened” us in so many ways with her knowledge and expertise. I definitely recommend her services and you’ll know you’ve hired the right person! ~ Michelle and Dennis, San Diego, CA.